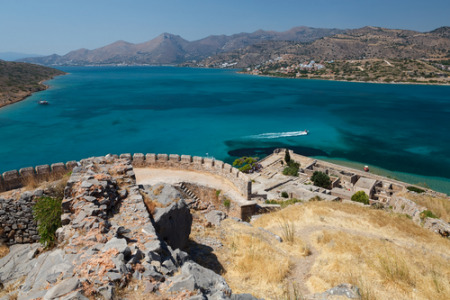 Elounda holidays takes you to the beautiful Greek island of Crete. Located on the north eastern coast eight miles from Aghios Nikolaos, it is a fairly large and lively village. The village sits in a large bay, the Gulf of Mirabello and is centred round the pretty harbour with boats of all sizes bobbing in the Aegean. Behind the harbour is the village church with its separate bell tower. Framed by mountains, the resort is surrounded by great natural beauty and is the perfect place to relax in pleasant sunshine and watch the world go by. The gentle movement of the boats can be quite soporific and you may need a shot of caffein to restart your motor. If you find a cheap Elounda holiday appealing and you wish to avoid the tiresome task of trawling through web page after web page trying to find the best deal, try our simple search facility. You'll find over three dozen travel companies competing for your custom. It is simple to use and remember, competition brings out the best bargains. Our search facility enables you to see, at a glance, the Elounda holiday that is the cheapest and the one that offers the best value for money. All you have to do to secure the holiday is make a phone call. To book the best deal, and to avoid disappointment, ring today.